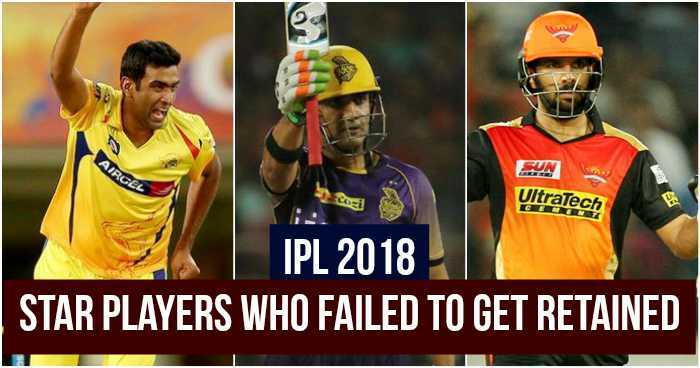 As all the eight franchise of Indian Premier League (IPL) have declared their retained player list for IPL 2018. There are some shocks that some players are left out and some players are retained. Only Axar Patel is retained by Kings XI Punjab (KXIP) comes with a shock, as they left Glenn Maxwell, David Miller, Hashim Amla, Sandeep Sharma and Mohit Sharma. Also, another was the retention of uncapped Sarfaraz Khan by Royal Challengers Bangalore (RCB). Some retentions were predictable as retention of MS Dhoni and Suresh Raina by Chennai Super Kings; retention of Virat Kohli and AB de Villiers by RCB and Rohit Sharma by Mumbai Indians (MI). And also Sunrisers Hyderabad (SRH) went on to retain David Warner. Gautam Gambhir was not retained by Kolkata Knight Riders (KKR), despite being captain of the side from 2011 and became the champion twice. Also, Gautam Gambhir is one of the top run-scorer in the tournament. While KKR franchise would be planning to get him back through Right-To-Match (RTM) card. It will be a huge setback if KKR doesn’t continue with Gautam Gambhir on their side. With the star players filled in Chennai Super Kings (CSK), Ravichandran Ashwin was not retained by CSK. CSK retained MS Dhoni, Suresh Raina and Ravindra Jadeja. If CSK is planning to get Ashwin on their side in the auction, it will affect deep in their pocket. CSK can’t use RTM card for Ashwin as they have already retained three Indian capped player. The star Indian opener Shikhar Dhawan was not retained by Sunrisers Hyderabad (SRH). SRH retained only two players, skipper David Warner and Bhuvneshwar Kumar. While Shikhar Dhawan was the third possible choice, SRH may want them to get him through RTM. Mumbai Indians (MI) lead spinner Harbhajan Singh was not retained. The reason may be as they don’t want to lose Jasprit Bumrah. MI would certainly want the experienced bowler on their side. But MI can’t use RTM for Harbhajan Singh as they have already retained three Indian capped player; MI has to outbid their opponents at auction to get Harbhajan Singh. Yuvraj Singh was not retained by Sunrisers Hyderabad along with Shikhar Dhawan. This is the second time Yuvraj Singh is not retained; earlier in 2016 RCB didn’t retain him. SRH can still retain him through RTM. It will be interesting to see teams who released their star players to use RTM (Right-To-Match) card will be successful or not. As budget will be also a point of consideration.